Pattavia is probably in the best condition of any of the courses locally and represents good value with low season green and caddie fee. A good field of thirteen made the effort as it was the last games of this tour for Takeshi Hakozaki, Brett Chan, and Raleigh Gosney, all returning to their home countries. Neil Griffin set a cracking pace on the front nine with twenty-four points before throwing out an anchor and ending with thirty-eight points in first place. Brett Chan in his first visit for two years made his first appearance in the winners’ circle with thirty-five points in second place, beating Tony Robbins into third on countback. Only two near pins were claimed and one involved a remarkable piece of skill. Jimmy Carr on the third par three hit his ball no more than one foot off the ground, it quickly came back to earth bouncing every which way, narrowly avoiding the gully in front of the green and rolled up to within two feet of the pin! Low season pricing means this fine course is now back on our playing roster. We were allocated the B & C nines and as expected the ‘pick, clean, and place’ rule was applied. Our optimism about finishing dry all changed on the twelfth tee when the lightning became frightening and the rain tumbled down, requiring an hour-long stay in the nearest drinks station. By the time it stopped raining and the lightning disappeared our first group had decided to pull up stumps and walked back to the clubhouse. There they met our second group about to tee off on the tenth so back they went to the twelfth to continue the round which all finished with the exception of Jimmy Carr, who by this time was in the shower. A bright sunny day lured out eleven golfers for our end of week game at Bangpra. Following some recent criticism in regard to the state of the course, it was nice to see that management took note as today the layout was in very nice condition. In particular the bunkers, which were very shabby last time, were well groomed today, the fairways recently mowed and the greens were nice to putt on without being ridiculously fast as they sometimes can be. Most courses will now start to improve as monsoon rain will green them up nicely. Geoff Cox took the honors today with a well compiled thirty-seven points. The ever-consistent Alan Sullivan took second one stroke adrift while Geoff Parker rounded out the scoring with a score of thirty-four points. Near pins went to Ken Hopkins, Alan Sullivan, Geoff Cox and Gerry Cooney. 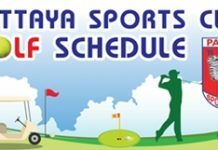 One week to go before most golfers depart Pattaya for various upcountry trips to get away from the madness of Songkran. The Bunker Boys will return to Khao Yai this year to play Forest Hills (Sir James), Khao Yai Country Club, Kirimaya, and Mountain Creek, with a possible game at Lotus Valley or Royal Hills on the way back to Pattaya.